Having already reviewed the Audi A4 I was a bit reluctant to do this model as I thought it would just be a case of ‘same old same old’ but after some due consideration I decided to give it the benefit of the doubt and go for it. For one I’m happy I did. Apart from being similar to the A4 in many respects it still had its own individuality. Unlike the A4 Carrera have decided to mount the on board electronics in the conventional position between the motor and front axle. This equals up the front / rear balance but surprisingly doesn’t improve on the A4’s handling. 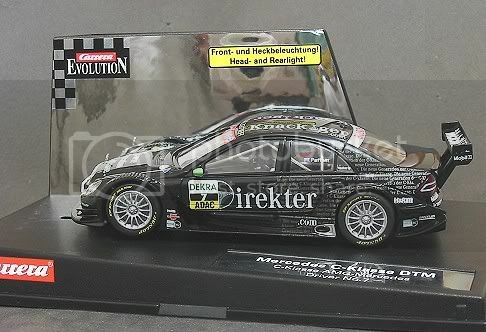 This model is finished in the “Direkter/Straffer.com” Livery, (both of which take you to the International Mercedes Benz website!) a case of this years new black is…. BLACK! Still very attractive but I’m not really a ‘black’ person. (It’ll be a devil to keep clean!). As we are coming to expect, the detail and finish are first class. It is a difficult job to find any defects worth worrying about on this model. Black hides a multitude of sins and this model has very few. The three pointed star sits raked back on the front of the bonnet and all else flows on after it. This model also has the detachable vulnerables! The rear wing and the door mirrors detach for racing to reduce the risk of breakage. I have to admit that the rear wing was quite stiff first time whereas the door mirrors virtually fell out. I like this idea if only from the point that when its racing days are over, I can pop them back in and clean it up for the display case with all bits intact. The mirrors are almost lime green which shouldn’t make them too hard to find in the bottom of your race case. Once again a very busy interior but good points like brass front and rear axle bushes, firm motor mount and a smooth out of the box gear mesh. Carrera have once again allowed the lighting wires to rub on the axle components. Not a big deal in itself as the parts are well lubed but down the road there might be the odd problem with the odd model. Unlike the A4 the body is a cinch to remove. One thing though is the fact that after removing the body the side detail is still fixed to the chassis! So what I hear you all say! Well, one of the more important factors of body tuning, especially for non mag racing is the ability of the chassis to flex independently of the body. Also the ability of the unsprung weight of the body to move independently of the chassis and lastly, in magnet racing, the ability of the chassis to flex allowing closer proximity to the rails for the traction magnet! So! Body tuning HAS to include the loosening of the side detail screws. Now it’s time to shoot off to green lane on the local plastic/magnet track for its proving. All screwed up and unsanded, the model is placed on a well run green lane. We’ve been duelling for a good while with other models so off we go at a good speed and settle in for the first session. The model has the typical Carrera ‘wind-up’ on the straight but with the sliding magnet set well forward has an ‘on-rails’ feel into and out of bends. Taking the speed up and up ‘til the ragged edge was reached, we managed a fastest lap of 6.690. I attribute this to Carrera’s SOOB wheels and tyres. At 22.0 mm diameter they take some turning but I must admit, previous models didn’t take much sanding when the time came. After this the motor performance tails off a few tenths as the motor warms up. Stage two consists of tyre truing and body tuning. Once again the tyres were well rounded and little was achieved in truing. 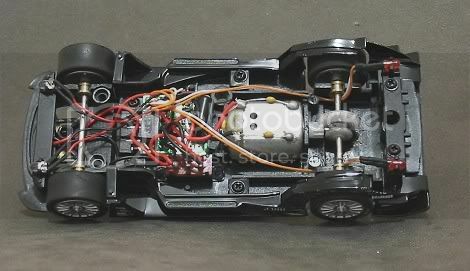 The body was difficult to set up as half of it remains attached to the chassis when removed. This piece still exerts the rigidity as one of the things we try to overcome by screw loosening. Eventually I managed, in spite of all this, to get a bit of movement. Back on the track and the model was very quiet. Another forty laps or so saw the fastest lap set early on at 6.602 secs. No milestones here and a touch slower than some other DTM’s . Tyre cleaning mainly, there is always a result after this process. Even on a well run plastic track there is advantage to cleaning tyres. It helps raise corner navigation and exit speeds enough to give a few tenths on the average lap. Sure enough, after a quick wipe and dry, the model was punted out for its final test. There was an immediate change and increase in its cornering and the lap time tumbled to 6.388 sec. 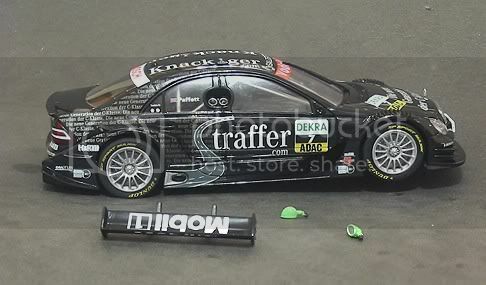 This puts it in the high end DTM times and in skilful hands would be on the edge of competitive. Once again on friend Gary’s track I took the opportunity during a lull in the proceedings to give the model its Non magnet testing. Body screws were retightened and tyres were run in a dusty patch to try to set the test back to scratch. Sure enough, with run in dirty tyres, the time on red lane after a good run was a mid to fair 7.758 sec. Half expected and once again the model was quiet and well behaved. The only antics it got up to was the back stepping out on hard acceleration from the bends. Corner entry speed was good and some times I was taken by surprise, half expecting a deslot only to find the model had hit the corner hard and stayed on, albeit a bit sideways on. No roll over or understeer with this one. If you were coming of it was going to be a sideways exit. Stage Two was similar to the Maserati in as much as it was impossible to improve on the SOOB times!! Again, the out of box performance was very encouraging. After a good scrub of tyres and a liberal application of tyre cleaner the model was set on its way. Like the A4 it was quiet, very quiet. Still no bad habits or surprises so as I cranked it up to maximum the model just did it. Fastest lap came in at 7.371 which is a little off the pace but very similar to its stable mate! Again, handling was very predictable and the only reason I could think that was not letting it go any quicker was the slow wind up effect the model has. Once rolling the motor has plenty of go. The brakes are fair to poor being less effective than some of the Scaley and Fly ‘S’ cans but high corner entry countered it to some degree. The heavier than average model and the good Carrera rubber were its saving grace. Front Axle width				58 m.m. Rear Axle width					58 m.m. Another finely detailed model with detachable vulnerables! As the new slot car boom gains momentum models like this will find place in the hearts and race boxes of those that race on fast medium to long circuits. On my local four lane scalex track of about 25 metres it is four to five tenths slower per lap on average compared to Scalextric and SCX DTMs but with some judicious body tuning and a possible minor gear change, in the hands of a good driver, it could do well.